Scouting for field crop insects is not just left to corn and soybean growers. Now is the time for alfalfa producers to begin scouting their fields for alfalfa weevil, an insect that can cause severe defoliation if left unchecked. Many areas across the country have warmed up enough to where alfalfa weevil feeding will become more prevalent. Growers in the South should be scouting fields now, and in the central and northern cornbelt, being scouting fields over the next one to two weeks. To effectively scout alfalfa fields, entomologists recommend that growers collect a series of three 10-stem randomly selected samples from various locations in a field. Place the stems in a bucket and vigorously shake them, counting the number of alfalfa larvae that fall into the bucket. The height of the alfalfa also should be recorded. The adult alfalfa weevil is a small, brown, snout-nosed beetle with a dark stripe down its back. The alfalfa weevil larva is green with a black head and a white stripe down its back. The larvae develop through four stages, or instars. 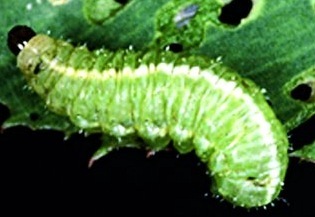 Larvae that are in their third or fourth instar cause the most foliar injury. First cuttings of alfalfa are at the highest risk for defoliation damage. The alfalfa weevil is controlled naturally by parasitoids — beneficial species that prey on the weevil and help keep its populations in check. In cases of high populations, the alfalfa weevil can be controlled with insecticides.